4.5"/55 (11.4 cm) Mark 8 Mod 0 Mounting. Note the fume extractor, muzzle brake and tampion. Royal Navy Photograph. Mod 0 was designed by the Royal Armament Research and Development Corporation and patterned after the Army's Abbot 10.5 cm (4.1") howitzer. The first prototype was built in 1966 and the first service installation was on the Iranian frigate Zaal (renamed Alborz) in March 1971. HMS Bristol (Type 82) was the first British warship fitted. Part of the original requirements set down by the Royal Navy was that the Mark 8 be able to fire 90 rounds in 7.5 minutes. Water cooling to achieve this ROF was rejected as it would have added too much weight to the mounting, so instead the metallurgy of the barrel was improved in order to withstand the heat generated. Mod 0 was designed to be ready to fire within ten seconds from the shutdown state and has a somewhat low rate of fire in order to reduce complexity and heat build-up. The developers of this mounting reportedly considered a rapid response to be more important for defense against missiles than a rapid rate of fire. The gun mounting itself is unmanned. It is constructed of fiberglass and was designed by Vickers. 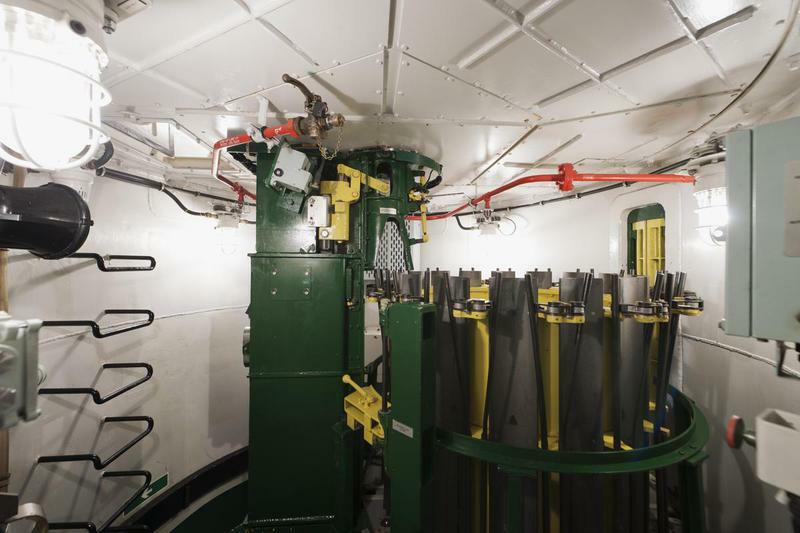 Up to sixteen ready rounds are carried vertically on an indexing feed ring. 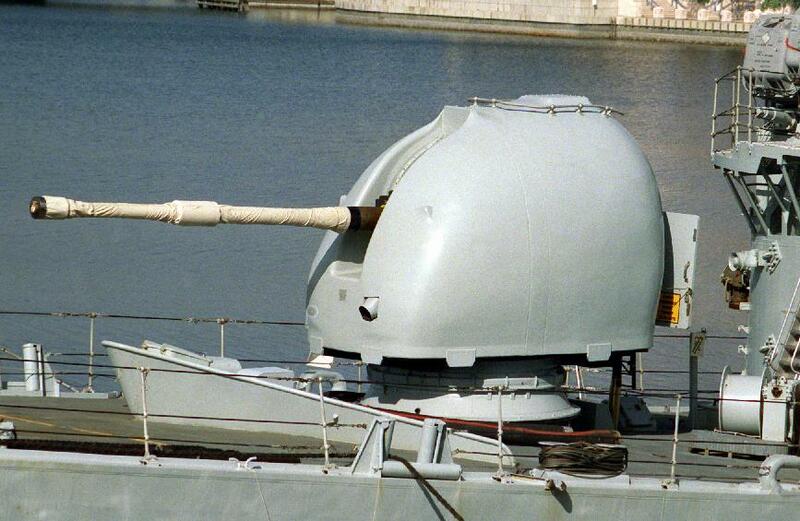 These guns on the Type 21s proved to be less reliable than the older 4.5" (11.4 cm) Mark 6 (Mark V gun) on the Type 12 during the Falklands War, with HMS Arrow and HMS Avenger forced to cease fire on multiple occasions due to faults. The fire control system for these guns is the BAE Systems Sea Archer 30 (GSA 8) electro-optical fire control system. The latest 4.5" (11.4 cm) mounting, the "Electric Gun" Mark 8 Mod 1, is a boxier-looking mounting that is designed to reduce the radar cross section. RO Defence, a division of British Aerospace Systems (BAE), was awarded the contract in 1998 for the full development, production and support of this new weapon system. The Mod 1 uses electric motors for almost all functions in place of the hydraulic actuators and servos used on Mod 0 except for those motions on the elevating mass. These changes improve safety, reduce power consumption and cut the overall mounting weight by 3.7 tons (4 mt). Lower deck space requirements have also been substantially reduced. Some Mod 1 mounts will receive a special antenna as part of the Experimental Course-Corrected Shell Program. About 25 Mark 8 Mod 1 mounts are to be ordered by 2008. As of June 2005, it is planned to refit all Type 22 Batch 3 and Type 23 frigates and two Type 42 Batch 3 destroyers - HMS York and HMS Edinburgh - plus one mount for HMS Collingwood, the Royal Navy's School of Communications and Weapon Engineering. 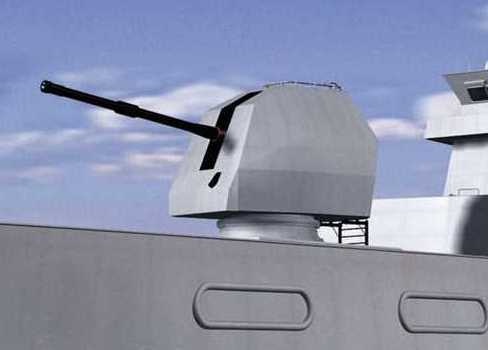 The first six units of the new Type 45 destroyers will also use the Mod 1 gun, although later units may use a 155 mm Naval Gun. According to a statement made in the UK House of Commons on 15 March 2005 by the Minister of State for the Armed Forces, the Rt. Hon. Adam Ingram, there are no plans to retrofit any additional Type 42 Batch 2 or Batch 3 destroyers with the Mod 1. In August 2001 the frigates HMS Norfolk (Type 23) and HMS Cumberland (Type 22 Batch 3) were the first ships to be upgraded with the Mod 1. A comprehensive, first ship fit, harbor and sea trials program culminated in test firings by HMS Norfolk in May 2001. 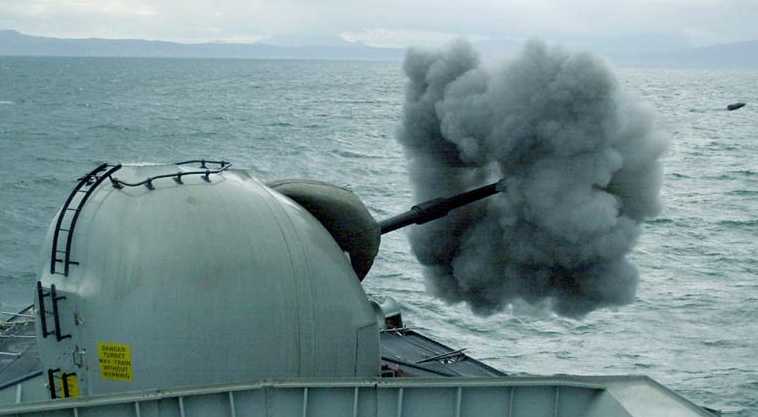 In October 2001 HMS Norfolk conducted a successful NGS shoot against shore targets at Cape Wrath in the North of Scotland, firing just short of 100 rounds in very rough weather. 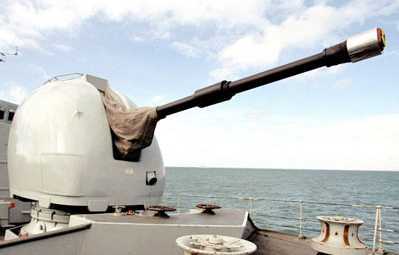 As of February 2003, six guns had been delivered to the Royal Navy and HMS Collingwood has replaced the Mod 0 mount with the Mod 1. A planned refurbishing program to modernize the removed Mod 0 guns to a Mod 2 standard for use on other ships has been cancelled. Both Mods of this weapon can fire the new "base bleed" High Explosive Extended Range (HE ER) round. The HE ER round increases the maximum range to 30,100 yards (27,500 m) and has been developed by BAE Systems (Royal Ordnance) Defence under a £50 million contract awarded in 1997. 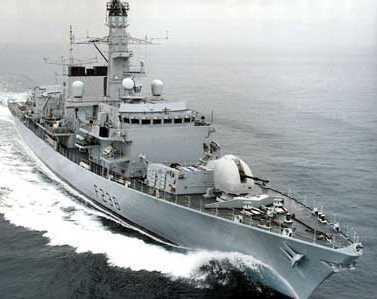 HMS Richmond was the first RN vessel to receive the HE ER round in April 2004. Munitions for this weapon are also made by FI Indústria e Comércio Ltda (Brazil) and Eurometall NV (Netherlands). All British 4.5" naval guns have an actual bore diameter of 4.45" (11.3 cm). Mod 0 has 18 ready rounds, but Mod 1 reportedly has none, probably as a top-weight reduction measure. The HE round is used for both air and surface action with the fuze mode selected electronically just prior to ramming. Two fuze types were originally provided, N7 (mechanical time) and N97 (multirole: direct action, proximity low or high altitude and post-impact delay). These have been joined by the UA 3345 Proximity Fuze, which is a derivative of the UA 3018 fuze used in projectiles for the 76.2 mm Compact. Outfits include illuminating, chaff (cut for I and J bands), AA practice and surface practice rounds. 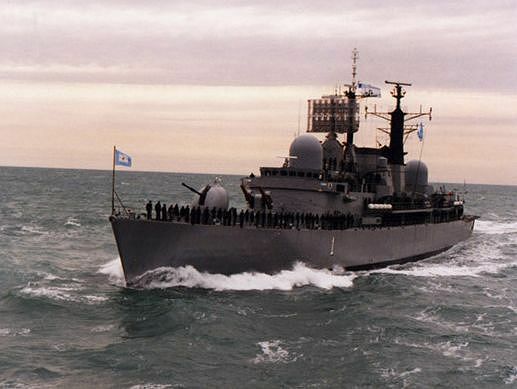 The Royal Navy had a requirement of 1,548 HE rounds for FY 1994-1995. Illumination rounds use a mechanical time fuze and burn for approximately 40 seconds. 1 All rounds use multitube MNLF/2P/M08 triple-base propellant and have a N44 series electrical primer. Mod 0 uses electric motors equipped with Thyristor RPC for elevation and training. Loading is via hydraulic mechanisms. Mod 0 requires 440 Vac 3-phase, 68 KW for control, 440 Vac 3-phase, 20 KW for Heating and 115 Vac single phase, 3 KW for air conditioning when the mounting is not in operation. Ammunition is fed to the gun via a hydraulically operated pendulum loading arm with tray, pivoted on the cradle trunnion. The arm swings down vertically to the fixed-structure hoist to pick up the next round, which is loaded in two stages into the tray. The arm then elevates into line with the gun and a hydraulic rammer pushes the round into the breech. Fuze setting is a wiping action, activated by a mechanism attached to the carriage which engages pawls on the nose of the projectile as it is elevating in the loading tray. Mod 0 requires a gun crew of four men: Turret Captain, Magazine Captain and two loading members. Up to 14 rounds can be remotely fired before the gun crew is in position. 1 This is the normal recoil distance. The maximum, metal-to-metal recoil distance is 17 in (43 cm). 4.5"/55 (11.4 cm) Mark 8 Mod 0 on HMS Northumberland D01. Royal Navy Photograph. 4.5"/55 (11.4 cm) Mark 8 Mod 0 on HMS St. Albans F83. Royal Navy Photograph. 4.5"/55 (11.4 cm) Mark 8 Mod 0 on HMS Avenger F185 in January 1992. U.S. Navy Photograph No. DN-SC-92-04971. Gunbay on HMS Edinburgh. Rounds are fed from the rotating feed ring to the hoist on the left and then up to the gunhouse. IWM photograph DC 1502. HMS Daring running propulsion trials in mid 2007. Royal Navy Photograph. 4.5"/55 (11.4 cm) Mark 8 Mod 1. Compare this mounting to the Mod 0 shown above. Image copyrighted by BAE Systems. 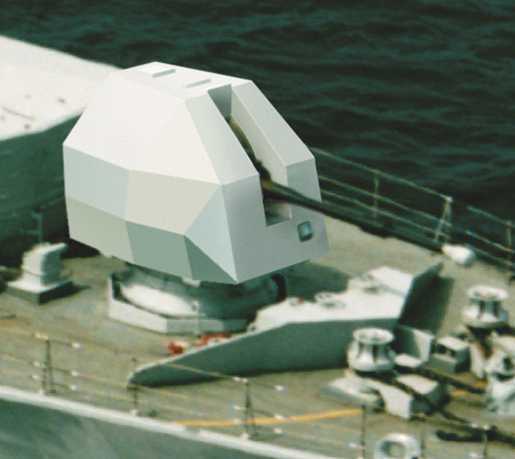 Artist's Conception of Mod 1 Mounting on a Type 45 Destroyer. Image copyrighted by BAE Systems. 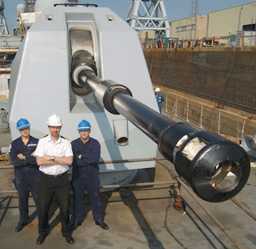 4.5"/55 Mark 8 Mod 1 on HMS York. Note the muzzle brake. Royal Navy Photograph. 4.5"/55 (11.4 cm) HE ER Round. Image copyrighted by BAE Systems. "British Naval Guns 1880-1945 No 16" article by John Campbell in "Warship Volume IX"